I’m still spinning away and building up a stash of handspun. I’ve got another bobbin of singles that I’m so tempted to combine with Red Velvet, as pumpkinmama did. It would make such a nice sweater with Hive changing to Hive plied with Red Velvet changing to Red Velvet, wouldn’t it? It’s been acting strange, hasn’t it? I’m super lame with this website stuff (so I didn’t catch on until it was too late), and there was someone, somewhere clogging up my server with constant queries of the blog’s database. The IP is now blocked and life should resume. If you visited the site today and saw that awful Account Suspended page, I apologize. I really did pay my bill. We really found a house and we’re moving on September 5. My dye studio needs to be built there, so it will take awhile, depending on plumbers and electricians, etc. The actual act of buying the house is taking up far more of my time than I ever conceived. I have not started dyeing the next round of the fiber club yet. I also have not started packing. I’ll keep everyone posted about it all. Thanks for your great work. I hope to be a part of one of your clubs someday! that is beautiful. i love your sweater idea – the color shifting would be beautiful!!! congrats on the big move! how exciting! I kick myself for not being part of the last fiber club because I want to bathe myself in that Hive. YUM. Good luck with the moving! It is, indeed, horrible and complicated and living in a cardboard box starts to sound like a good idea. But that first night in your new bedroom makes it totally worth it. That would be a fabulous, fabulous sweater! Do it! 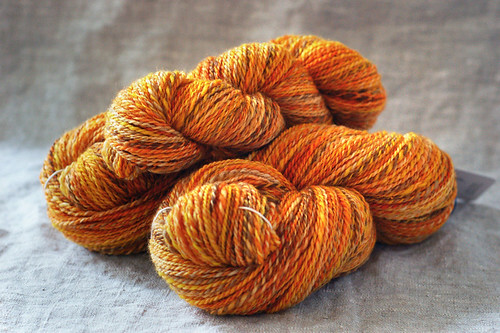 Such a gorgeous colorway you’ve spun – and it would definitely make a stunning sweater! Ahhaha, Serenity now, Insanity later! i love that handspun, seriously pretty stuff! Good luck with your move and packing an all of it! I’m so excited for you about the house! But you have all my sympathies on the stresses of packing and moving and getting settled into a new place. That handspun is seriously gorgeous. I can’t wait to see what you do with it…it would make an amazing sweater! “1 lb., 1008 yards.” Those quantities sound so… MYTHIC to me! I am very much in awe of spinners. And your Hive really glows. Mmmmm! I love the orange. It is gorgeous! Good luck with the buying and moving. We just completed a new house purchase and move and Wow… I felt as though I had a one track mind and was completely incapable up accomplishing anything else for weeks. Congrats on the house,and good luck with the move! I am completely in love with the orange yarn. It’s so beautiful, and the perfect color to segue from summer into fall. The gradation of color from Hive to Red Velvet would be sublime and gorgeous in a sweater. Do it. DOOOWIT! Yay for finding a house! I hope the move goes as well as a move can ever go. Congrats on the house! Looks like you’ll have a nice studio when it’s finished! Can’t wait to get some more of your yarn and fiber. Did sign ups for the next round of fiber club start already and did I miss them? I hope not. I’ve been in from the start and want in the next round as well! Spun up some of your wonderfull fiber, need to post about it soon. I hear you on the moving. I’m 3 days away from moving here and not even remotely close to done packing. GAH! I really shouldn’t be surfing blogs. But I needed to look at some pretty yarn to destress for a bit.